This is worth watching/listening to. 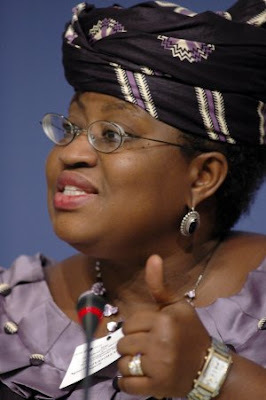 The former Finance Minister Ngozi Okonjo-Iweala gives a robust speech at the recent TED event in Arusha. Thanks BK for reminding me. J watched this yeserday at Paul's. Very impressed that she did the whole ting without notes or prompter. Got her figures wrong on the fixed line numbers though. There were 450,000 lines in Nigeria before the GSM companies moved in not 4,500. When are you back. Pls email with details. Also update on Naija bloggers event. Well-spoken, intelligent. A little preachy and revisionist, but it's a great start. Correction, this was the speech that Dr Iweala gave at TED in Monterey. Her Arusha speech is not online yet. For coverage of the recently concluded TED Global Arusha please go to the TED Blog or one of numerous blogs that covered the event. Chxta, I'm with you on that. Oops. Thanks for the correction Emeka..
why do i find it EXTREMELY hard to believe there were supposedly only 4,500 landlines in naij? i do know there is A LOT of poverty but common Ngozi, talk about exargeration! i think she probably meant 45,000 or 450,000. (i know she said it more than once...but that just isn't realistic). or do you think she confused the data with access to the internet? great speech anyway, hopefully we'll be gettin more than just a few second hand clothes on the continent soon. yes she goofed. She should have said 450,000. I was at TEDGlobal in Arusha and have recently started a blog on healthmatters in Nigeria. Kindly look at the site. We would appreciated any publicity you give to it on yours!